It was a long search for a Traditional Siamese to fill the void left by her much loved, Sandy, who passed away at the age of 18, that brought about the creation of The Traditional Siamese Cat Association. 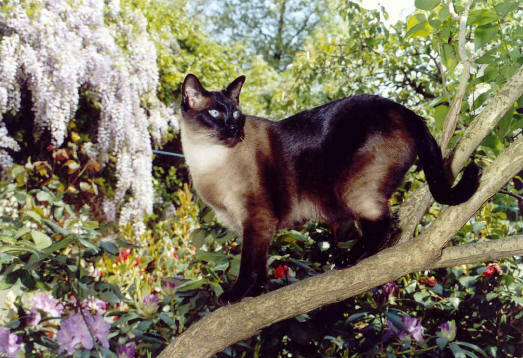 (UK) by Siamese breeder, Sheelagh Le Cocq. Years of searching through out England, contacting the Siamese Cat Clubs and writing to cat magazines brought little success. Sheelagh's quest received an unexpected push. Since her address had been published in British Cat Magazines, she received two to three hundred enquiries from people, asking her what had she found? Could these kittens be purchased? Exactly like Sheelagh, others were looking for the body style of Siamese they had loved and owned in prior years. They shared a common memory and deep bond with the old style Siamese. With so much interest Sheelagh spear headed the formation of her Association. The Traditional Siamese and Classic Siamese of the past did not resemble Modern Siamese being shown today. This added to the ground swell of requests from those who remembered what the real and original "Siamese" cat looked like. Diligently writing back to each individual person, who responded to Sheelagh eventually, grew into the publication of Sheelagh's Newsletter. It includes her research, stories about current breeders, details of kittens for sale, new developments, club activities and cats at stud. Over time Sheelagh's newsletter expanded into a full scale magazine where like-minded people expressed their news and concerns. The Newsletter is a vital connection to supporters of the Traditional Siamese and the classic Siamese, who are the original "Siamese" cats. At first Sheelagh paid for the Newsletter herself, but in order to keep it going a fee to cover printing and postage costs became the "dues" for membership in TSCA.. The TSCA formed into a strong, non-political, organization unaffiliated to any governing body, consisting of people with the same love, goal and aspiration: the restoration and preservation of the old-type, or original "Siamese" cat. The TSCA caters to lovers of the Traditional Siamese (also known by the term “Applehead”) and the Classic Siamese and are getting cats of these original "Siamese" on exhibition at cat shows in England. A dedicated number of volunteers keep this effort going. Please go to the Show News section on this Home Page for news and schedules of the Club's activities. One of our main purposes is to assist others in finding a kitten or a stud cat These details are freely available by contacting Sheelagh Lecocq directly by e mail, letter, fax or telephone. Likewise, if you have suitable kittens to sell or a cat at stud, there is a small fee to place your advertisement on this Home Page, or in the TSCA magazine. Please contact Sheelagh for details. This long treasured and most beautiful cat is being promoted to take its place once again on the world's feline stage.